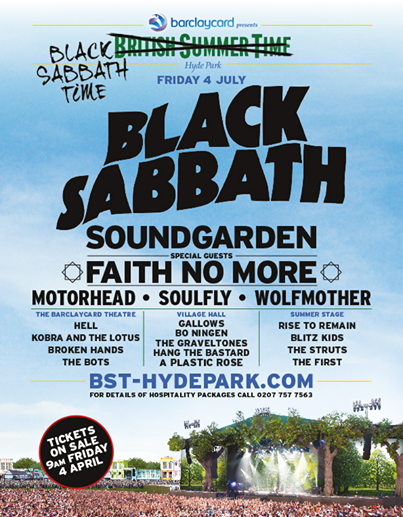 Black Sabbath will be headlining Hyde Park July 4th, 2014! It’s the rock royalty event of the summer, with Soundgarden and other special guests Faith No More, Motörhead, Soulfly, Wolfmother and many more. This entry was posted on April 3, 2014 at 11:29 pm and is filed under classic rock, Hard Rock, Heavy Metal, Metal, metal bands, metal music, Music, news, rock festivals, rock music, rock music news, world news with tags Black Sabbath, classic rock, faith no more, hyde park london, july 4th 2014, Motorhead, soulfly, soundgarden, wolfmother, world news. You can follow any responses to this entry through the RSS 2.0 feed. You can leave a response, or trackback from your own site.